Bob Garrett, George Rice and Dan Schueler recall the first TLCA Board (complete with its own President) came to be in 1978, when Bob Garrett’s second term as TLCA Ventura County president ended. Bob’s plan called for the new TLCA to create and maintain its own board, with chapters being represented by a delegate (an idea borrowed from CA4WD). Up until that time, the new TLCA had no official board and was managed by the TLCA chapters and their volunteers. The young association was doing very well, with many chapters involved and many more interested (and was hosting the Thanksgiving Day Run for the third time). 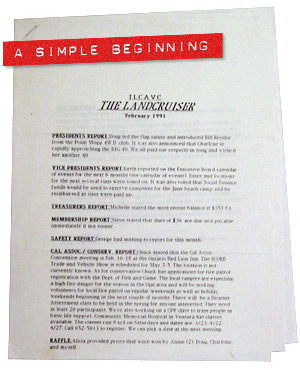 When the first president (name lost to time) took over in 1979, TLCA was still relying upon the chapter’s newsletters to distribute association information. 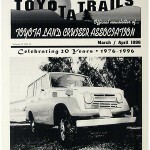 Melissa Fulton had served as the newsletter editor for TLCA Ventura County’s newsletter, The LandCruiser, since the club had formed in 1976. Carol Hillegoss and Diane Rice helped Melissa type, copy, insert and mail each newsletter. 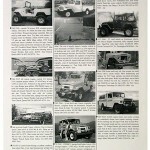 The LandCruiser was only a few pages long and the ladies were easily able to produce it. By the time Morey Estrada took over as TLCA President in 1980, the association was still doing well with many chapters involved and a very modest bank account. Morey belonged to the very active TLCA Madera County, along with new members Dan and Cindy Schueler, whom Morey had introduced to TLCA. Bob Garrett and George Rice, along with John and Melissa Fulton, were still very involved with TLCA Ventura County and active on the TLCA Board. Just as with their own clubs, the group realized that the association needed its own form of communication to distribute information in a reliable fashion. By now every-one was realizing that piggybacking on to chapter newsletters was hit and miss—some were very good, others less than stellar. The association was also experiencing a new membership category which was initially referred to as independents. Today we refer to them as individual members and they comprise over two thirds of the association’s membership. When the association first formed, it was comprised of chapters and the first TLCA members all belonged to a participating chapter. 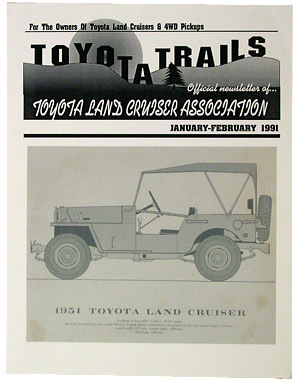 But as members left their local chapter, chapters left TLCA, or as other Land Cruiser owners learned about the association, they wanted to either maintain their association membership or join. An independent was a TLCA member who did not belong to a TLCA chapter (such as founder Bob Garrett when he moved from Ventura to Hollister Hills). Before the advent of Toyota Trails, these independent members received virtually no information at all. The Board realized that the time had come to initiate a newsletter. Melissa Fulton volunteered to get it started and everyone agreed, based upon her prior experience with TLCA Ventura County. In order to afford the endeavor, the Board also raised the dues (for the first time) from $5 to $10, with the justification being creation and distribution of Toyota Trails. 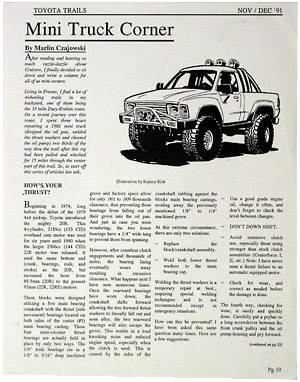 From its inception through 1983, Melissa Fulton managed Toyota Trails, which was initially only a few pages of black and white text. Everyone in the association was ecstatic about the newsletter and it was the association’s first tangible return for membership dues. And the publication immediately began fulfilling its communication role by providing information to all members, both chapter and independent. In 1983, as the association was beginning to struggle with maintaining membership and a balanced ledger sheet, Craig Roberts officially took over as Editor. The primary challenge was balancing the 200 copy distribution list with the 76 active members currently on record. While the association had increased dues to finance Toyota Trails, mailing out over 100 additional issues to non-TLCA members (in an effort to promote the young association) was eroding the finances. Meanwhile, Cindy Schueler, along with her husband Dan, had joined the TLCA in 1980 via Madera TLCA. They were actively involved with the association almost immediately at the Board level and Cindy had begun helping Craig Roberts with Toyota Trails. By 1988, Cindy took over completely as Editor of Toyota Trails (along with holding the association Board position of Vice President). By 1989, Cindy found herself assuming the vacated role as President of an association whose membership was about to double in the next 12 months. The momentum Dan Schueler had initiated as President in 1985 was bearing fruit as evidenced by steady growth and a robust bank account. 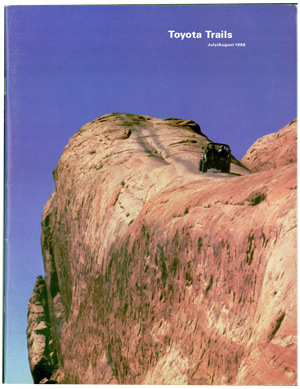 The Thanksgiving Run was being joined by another TLCA event called Rubithon, and these two events would get excellent coverage by the commercial off road magazines in 1989, even to the extent of the Thanksgiving Run being voted one of the top 20 OHV events in the west. But Cindy was so overworked by mid 1990 that Toyota Trails fell far behind schedule and missed a few issues. The association’s operating budget was over $15,000 per year and membership was quickly approaching 300 members—the work load to create the newsletter had exceeded the limits of the volunteer staff. Other factors affecting the newsletter were chapters and independent members questioning the return on their membership dues, and an increasing demand for technical information about Land Cruisers, to which the association was not prepared to respond. Fortunately, Toys on the Rocks newsletter editor Gary Bjork had been actively involved with TLCA and saw an opportunity. Gary had been extremely successful with his chapter’s newsletter and felt given the opportunity and authority, and utilizing new desktop technology, he could turn the Toyota Trails newsletter into a publication worthy of dues paid, including extensive chapter, association and technical editorial content. Dan and Cindy Schueler knew this was exactly what the association needed at this critical point in time and helped Gary take his proposal before the TLCA Board. This was not an easy sell—it required TLCA lending the capital to purchase both software and hardware, and the association’s second dues increase, this time from $10 to $15. Gary also wanted full control of Toyota Trails with regard to layout and content to ensure he was successful in achieving his vision of what Toyota Trails should be to the association. Many on the Board felt Gary would not be able to accomplish this and only agreed to a one year trial run. 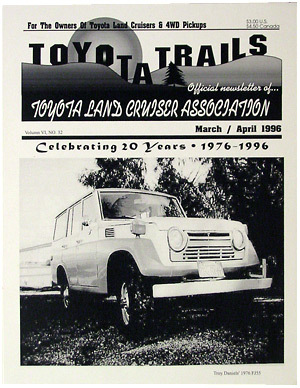 In January of 1991, the new Toyota Trails, under the guidance of Gary Bjork as Managing Editor, rolled off the presses and TLCA members had never imagined anything like it. 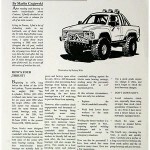 No longer a newsletter, this new Trails had the feel of a publication dedicated solely to Toyota Land Cruisers and pickups. No one questioned Gary’s ability to pull it off after thumbing through that first issue and seeing prior content reformatted for a new look, and lots of new content including chapter information and technical information. John Fulton, Dan Schueler and Mike Bennett all regard this event as effectively launching the association as a national organization, especially when coupled with the extensive publicity of TLCA events during the recent years. 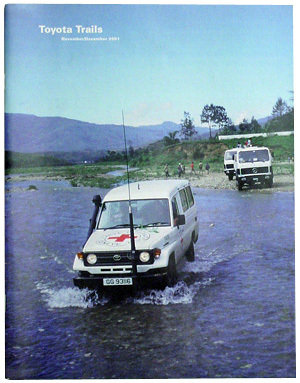 Membership in TLCA meant more than just belonging, it now meant receipt of the only publication dedicated solely to the Toyota four wheel drive and the TLCA. TLCA’s membership, which was at a record 300 members in 1991, jumped to 500 by 1992 and doubled again in 1993 to nearly 1,000 members! 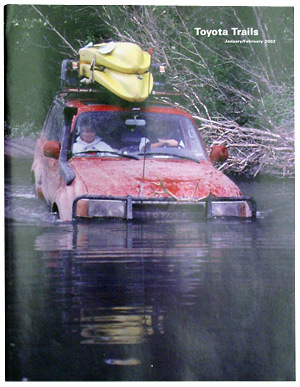 Gary had easily quelled any concerns Board members might have had about his ability to turn Toyota Trails into a premier publication within months of taking over as Managing Editor. Gone was the 16 page photocopied newsletter and in its place was a professionally designed 40 page publication. 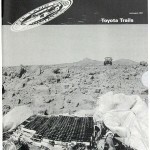 Gary soon had Toyota Trails rolling off the presses on a regular bi-monthly schedule, complete with deadlines for submissions and alternating associate member businesses as technical editors. Regular columns such as Clevis M. Bungeecord evolved along with world class animations provided by Rainey Kirk from the Southeast Toyota Land Cruiser Association. Rainey would become instrumental to Gary and Trails with his Cruiser and pickup graphics. Gary ran the first Truck Tech column in January of 1991, with Marlin Czaijkowski offering his novice yet growing knowledge, and Mark Algazy provided random Tech Tips. 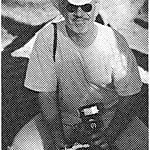 The first formally announced Tech Editor was Mike Trathen, who later became very involved with TLCA and Rubithon. 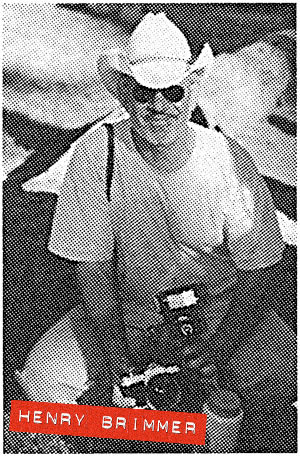 Richard Petrulio helped Mike until fully assuming the Tech Editor role in November of 1996. In 1992, armed with more content than he thought possible and a support staff he had assembled from the pool of TLCA members, Gary was ready to put his publication to the test. He entered Toyota Trails in a contest hosted by United 4 Wheel Drive, which judged various OHV publications based on content, format and best overall design. Much to Gary’s surprise, he won the Editor’s Award for content. 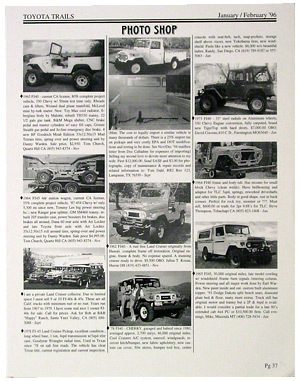 Not satisfied, Gary returned in 1993 and won the grand prize for best overall publication, beating the heavily favored and long time winner, In Gear, produced by CA4WD. While TLCA members were not surprised, Gary was and cherishes that award to this day. When Gary won the award again in 1994, some folks outside TLCA were already beginning to complain that Trails was sweeping the awards and Gary backed off, choosing not to enter the contest in 1995. 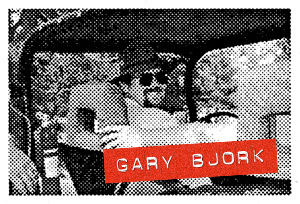 Gary also secured the first Toyota Trails advertisers in 1992, in an effort to generate some return on the investment—he wanted Trails to become financially self sufficient. Gary appreciated the businesses that were always there for the association, businesses such as Specter Off Road, Man A Fre, and Downey Off Road, all of whom regularly advertised. From the time Gary took over in 1991, with Toyota Trails distribution around 300 members, through 1998 when the job simply got too big at over 4,000 members, no one took more ownership for growing the association than he did. To read his Editor’s column today only reinforces the notion that Gary was much more than an editor—he was a coach, a mentor, a visionary, a cheerleader and most important of all, a fellow TLCA member and friend. 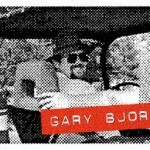 In late 1997, Gary Bjork met fellow TLCA member Henry Brimmer and the two quickly formed an alliance. Henry brought something to Trails it had never experienced before—professional graphic design knowledge and business experience. Henry Brimmer recalls traveling through Michigan towing his recently purchased Land Cruiser behind his motor home. 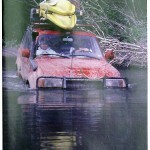 When he purchased the old Cruiser, he found a very old issue of Toyota Trails in the glove box. He did not pay much heed to it at the time but when his Land Cruiser’s transfer case exploded while being towed, Henry found himself pulling out that old issue of Trails and lo and behold, there was a vendor selling parts not six miles from where he had broken down. Shortly thereafter, Henry contacted Gary Bjork and stated, “No offense but Trails could be better.” Henry immediately recognized Toyota Trails as a very honest, seat of the pants production. There was no grid and he found it hard to follow articles as the columns jumped around. Henry had recently accepted a job at Sierra College in California and went to visit Gary a short time after contacting him. Gary Bjork recalls that when Henry contacted him, the timing could not have been better, as he was beginning to search for a graphic designer. The two hit it off immediately and remain good friends to this day. Gary took Henry to meet then President Ron Patston and introduced him as a potential candidate for the graphic designer position the association was seeking to fill. Ron Patston knew the value of corporate branding and quality design. Ron and Gary brought Henry on board the Trails team for a couple of trial issues to see if everyone liked the results, beginning with the July/August 1997 issue. But Gary was not satisfied with the black and white format of Trails and pushed for the next logical step in Trails evolution—color. 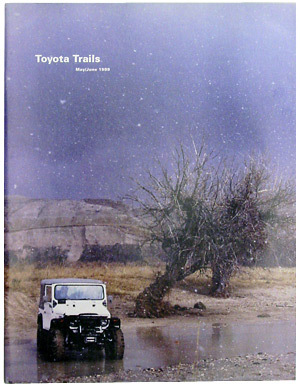 And in July/August of 1998, TLCA members witnessed the first color issue of Toyota Trails. 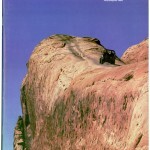 Henry describes his “Frame up restoration” of Trails on page 19 of that issue, with Gary Bjork and Peter Sadtler pictured climbing Lion’s Back at the first Cruise Moab event. 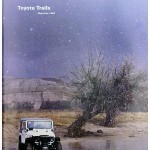 TLCA was ecstatic about their new color Toyota Trails and wanted to share their premier publication with everyone—and literally shipped every extra issue available to anyone who would take them, under the guise of advertising. To this day, there are no extra copies of that July/August 1998 issue available. Shortly after Toyota Trails went color, Gary’s wife became ill and he no longer had the time available to assemble Trails. Henry recalls these being very difficult times for his friends the Bjorks, and Henry eventually took over as Managing Editor for Trails, with his first issue coming out in January/February of 1999. 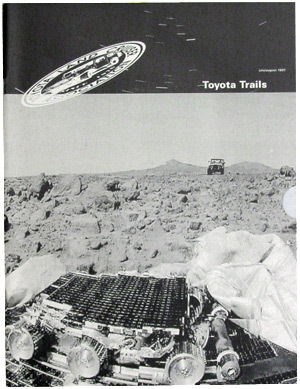 When Henry took over, he recalls the job was “a dream come true.” Toyota Trails was a subscriber publication— that is, it did not compete with other magazines, which meant more freedom for Henry as a designer. He did not have to create busy covers that tried to grab a customer’s attention with glitzy gimmicks. No one told him what to do and the design effort was much different than his past experiences, allowing him freedom and creativity. Henry’s primary goal was to maintain the spirit he initially found in Trails. 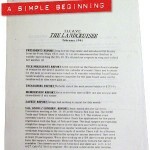 While he dramatically changed the format and design in order to achieve a clean and easy to read layout, he kept many existing features, such as the President’s and Editor’s columns, tech columns and the Chapter listing page. Just as Gary had done nine years earlier, once Henry had created the new layout, it was just a matter of putting the elements together and Trails rolled off the press in a regular fashion. During Henry’s tenure as Managing Editor for Trails, he was graced with exceptional talent in the form of TLCA members who stepped up to the challenge. Included is Mark Whatley, who had taken over as Technical Editor while Gary was Managing Editor. Henry knows of no other Cruiser aficionado who can so effectively take technical instructions and turn them into words that any layman can follow. 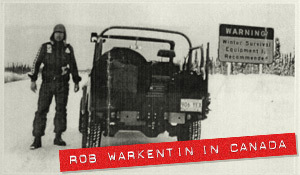 Mark Whatley’s knowledge is extensive, as with many other TLCA members, but none could produce the technical editorial like Mark has consistently done for Toyota Trails. 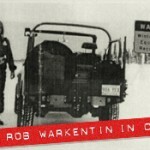 Rob Mullen also stepped up to provide technical information which is still drawn upon to this day. And when it comes to pure creativity and the love of all things Land Cruiser, Henry states there is no one like Henry Cubillan. 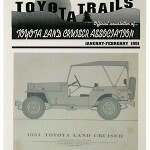 Henry C. is credited with putting the Land Cruiser wagon not only on the trail, but into the future of many TLCA members. Henry C. entertained TLCA members with stories of pigs in the mud, taverns named after Land Cruiser parts, and even the story of Johnny Appleseed, spreading the seeds of Toyota love throughout the territory. There were many others involved over the years, but Henry Brimmer believes the Trails Team during those years helped Toyota Trails become what it is today. 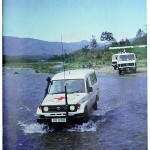 Henry also entered Toyota Trails in various competitions but he noted they were rather poorly conducted and had lost their integrity. Trails won quite a few awards for content, design, photography and overall excellence of publication, but the grandeur was not there. On one occasion, Henry remembers a competition failing to even send the award after announcing he had won. By January of 2003, the level of effort required and Henry’s own bout with cancer were wearing on him. The struggle of creating Toyota Trails and raising his family eventually became too much and a job opportunity in Utah forced him to let go of his dream. Today Henry lives in Illinois, has let go of most of his Cruisers and has successfully won his battle with cancer, leaving him ever more appreciative of the things he holds dear—his family and his quality of life. When Henry stepped down, many in TLCA feared not only for the future of Toyota Trails but also for the future of the association that Toyota Trails embodied. The transition from Gary Bjork to Henry Brimmer has been evolutionary in nature. But to have the editor leave required the association to conduct a search for a replacement editor, which was a new obstacle. Thanks to the efforts of key volunteers including Eric Vogt and Mark Hawley, a new Editor was found from within the talented ranks of TLCA members. Since that first issue in March/April of 2003, Toyota Trails has again evolved into the color magazine you hold in your hands today, thanks to the effort of our current Managing Editor, Todd Kaderabek. But that is another chapter in this story for another day.